They hold equestrian events here weekly. 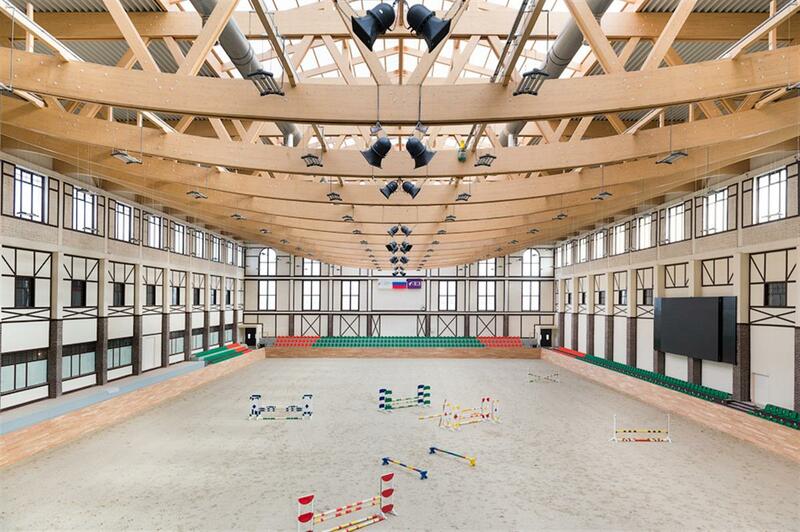 We not only have state-of-the-art indoor and outdoor arenas but also a hotel with a fitness and spa area, and an equine hospital." But, the most important thing is the great enthusiasm as the Maxima Stables team gets down to work: young riders from New Zealand, Australia, Canada, South Africa, Portugal, Syria, and Germany have already confirmed their attendance. Lars Meyer zu Bexten and the well-known Russian jumper rider, Vladimir Beletsky – sports manager of the event – oversee the athletic side of events. Competitions for riders between the ages of 12 to 14 (Children) and 15 to 18 (Juniors) are offered. Every Russian rider will bring two horses and provide one horse to a guest rider from another country. Together, they form a team. One of the highlights of the “Friendships” concept is to practise once with a trainer, who is amongst the world’s best riders in the jumping saddle. At the Russian Friendships, one of these trainers will be Marco Kutscher, bronze medal winner at the Olympic Games 2004 (individual and team) and double European Champion. Everybody is also particularly excited for the world-famous ringmaster Pedro Cebulka, who will come from his home country, Canada, just for this event. Pedro will accompany the guests on a sightseeing trip through Moscow and a visit to the Kremlin. "Next to the international team jumping competitions, we will also be offering various 1.40 m classes for amateurs and young riders as an additional incentive", says Lars Meyer zu Bexten. To make the trip even more worthwhile for the talented up-and-coming riders, Meyer zu Bexten is offering a special proposition: from July 23rd to July 29th, interested riders can participate in a preparation course for the Russian Friendships at the Bexter Hof in Herford.